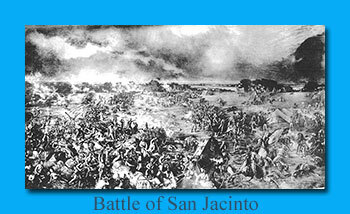 The battle of San Jacinto was the concluding military event of the Texas Revolution. On March 13, 1836, the revolutionary army at Gonzales began to retreat eastward. It crossed the Colorado River on March 17 and camped near present Columbus on March 20, recruiting and reinforcements having increased its size to 1,200 men. Sam Houston‘s scouts reported Mexican troops west of the Colorado to number 1,325. On March 25 the Texans learned of James W. Fannin‘s defeat at Goliad, and many of the men left the army to join their families on the Runaway Scrape. Sam Houston led his troops to San Felipe de Austin by March 28 and by March 30 to the Jared E. Groce plantation on the Brazos River, where they camped and drilled for a fortnight. Ad interim President David G. Burnet ordered Houston to stop his retreat; Secretary of War Thomas J. Rusk urged him to take a more decisive course. Antonio López de Santa Anna decided to take possession of the Texas coast and seaports. With that object in view he crossed the Brazos River at present Richmond on April 11 and on April 15, with some 700 men, arrived at Harrisburg. He burned Harrisburg and started in pursuit of the Texas government at New Washington or Morgan’s Point, where he arrived on April 19 to find that the government had fled to Galveston. The Mexican general then set out for Anahuac by way of Lynchburg. 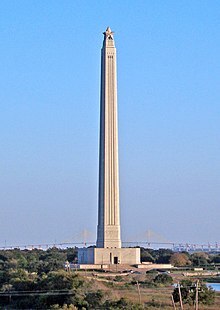 Meanwhile, the Texans, on April 11, received the Twin Sisters and with the cannon as extra fortification crossed the Brazos River on the Yellow Stone and on April 16 reached Spring Creek in present Harris County. On April 17, to the gratification of his men, Houston took the road to Harrisburg instead of the road to Louisiana and on April 18 reached White Oak Bayou at a site within the present city limits of Houston. There he learned that Santa Anna had gone down the west side of the bayou and the San Jacinto River, crossing by a bridge over Vince’s Bayou. The Mexicans would have to cross the same bridge to return. Viewing this strategic situation on the morning of April 19, Houston told his troops that it looked as if they would soon get action and admonished them to remember the massacres at San Antonio and at Goliad. On the evening of April 19 his forces crossed Buffalo Bayou to the west side 2½ miles below Harrisburg. Some 248 men, mostly sick and ineffective, were left with the baggage at the camp opposite Harrisburg. The march was continued until midnight. At dawn on April 20 the Texans resumed their trek down the bayou and at Lynch’s Ferry captured a boat laden with supplies for Santa Anna. They then drew back about a mile on the Harrisburg road and encamped in a skirt of timber protected by a rising ground. That afternoon Sidney Sherman with a small detachment of cavalry engaged the enemy infantry, almost bringing on a general action. In the clash Olwyns J. Trask was mortally wounded, one other Texan was wounded, and several horses were killed. Mirabeau B. Lamar, a private, so distinguished himself that on the next day he was placed in command of the cavalry. Santa Anna made camp under the high ground overlooking a marsh about three-fourths of a mile from the Texas camp and threw up breastworks of trunks, baggage, packsaddles, and other equipment. Both sides prepared for the conflict. On Thursday morning, April 21, the Texans were eager to attack. About nine o’clock they learned that Martín Perfecto de Cos had crossed Vince’s bridge with about 540 troops and had swelled the enemy forces to about 1,200. Houston ordered Erastus (Deaf) Smith to destroy the bridge and prevent further enemy reinforcements. The move would prevent the retreat of either the Texans or the Mexicans towards Harrisburg. Shortly before noon, Houston held a council of war with Edward Burleson, Sidney Sherman, Henry W. Millard, Alexander Somervell, Joseph L. Bennett, and Lysander Wells. Two of the officers suggested attacking the enemy in his position; the others favored waiting Santa Anna’s attack. Houston withheld his own views at the council but later, after having formed his plan of battle had it approved by Rusk. Houston disposed his forces in battle order about 3:30 in the afternoon while all was quiet on the Mexican side during the afternoon siesta. The battle lasted but eighteen minutes. According to Houston’s official report, the casualties were 630 Mexicans killed and 730 taken prisoner. Against this, only nine of the 910 Texans were killed or mortally wounded and thirty were wounded less seriously. Houston’s ankle was shattered by a rifle ball. The Texans captured a large supply of muskets, pistols, sabers, mules, horses, provisions, clothing, tents, and $12,000 in silver. Santa Anna disappeared during the battle and search parties were sent out on the morning of the 22. The party consisted of James A. Sylvester, Washington H. Secrest, Sion R. Bostick, and a Mr. Cole discovered Santa Anna hiding in the grass. He was dirty and wet and was dressed as a common soldier. The search party did not recognize him until he was addressed as “el presidente” by other Mexican prisoners.